Well, Hell’s Bells! Now just who is that a-think it? A whole damn slew of hillbilly boys from the country pickin’ on the “Thunder From Down Under”? Yes, ya’ll. I’m a talkin’ ‘bout a nice little country band called “Hayseed Dixie”. 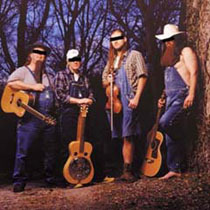 The band named itself as a sort of word play on AC/DC – Hayseed Dixie, get it? Well, this little ol’ AC/DC tribute ensemble certainly did take the audience at Smith’s Olde Bar on their own little High Voltage Highway to Hell that Tuesday night. And man, everybody…all them nice little bullboys and cowgirls was just a promenadin’ along to hillbilly versions of such AC/DC classics like “Dirty Deeds”, “Have a Drink On Me”, “Money Talks” and other nice little catchy tunes by other artists like Kiss, the Cars and a few others. The show started about 9PM when the band opened it’s set with “Dirty Deeds Done Dirt Cheap” in which the song’s refrain was sung as “cement shoes, rat poison, electric fences”! After playing the proverbial AC/DC songs, they kicked into the Cars “My Best Friends Girl” as well as Kiss’ “Calling Dr. Love”. Also included were a few traditional folk instrumentals in what seemed to be a nearly three hour set. They even encored with a little Buck Owens. Overall rating: Damn Good!